E-health in Sidama Zone: improving the social currency of health extension workers? This blog explores how e-health can be used to create a more gender equitable health response in Ethiopia. 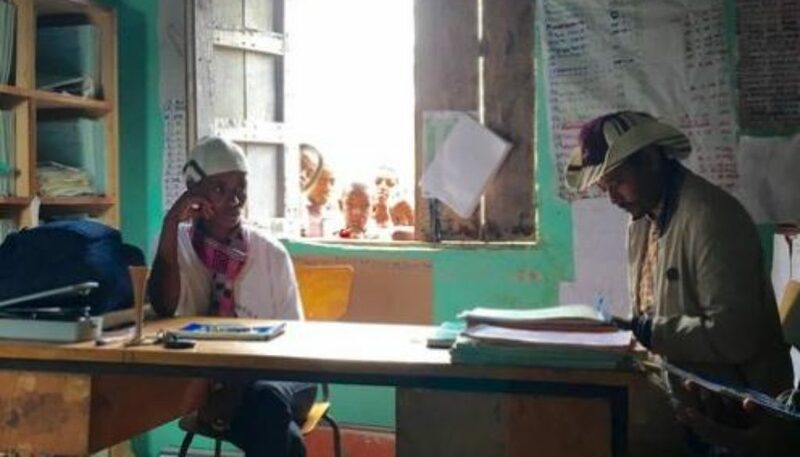 We’re sat in the small health post of Becha kebele, listening to Mehret Lamiso, a health extension worker (HEW) in this kebele for the past 9 years, share her experience of the new e-health platform that is operating Sidama Zone, Southern Ethiopia. During our discussion, community members whose curiosity has been piqued, gaze through the window casting shadows on the paper reports that adorn the walls. These walls tell the story of tuberculosis (TB) REACH success project in this region, which by bringing services to the community, increased TB case notification – as a result annual TB detection rates increased from 60% to >100% and treatment success improved. In particular, the programme was able to increase detection among previously underrepresented groups, such as women, children and the elderly, and brought the ratio of TB positive men to women from 3:1 to 1:1. As a consequence of the programme, TB and HIV co-infection have reduced and the success of this programme means it is set to be rolled out nationwide. The e-health platform, which is being implemented across six districts in Sidama zone (population of about 3.5 million), is linked to TB REACH, and builds on successes in this programme in TB case finding and management. Within TB REACH, HEWs used mobile phones to contact field supervisors and report that they prepared smears to collect the slides; field supervisors then collect the slides to the laboratory for examination. This and other examples suggest that rapidly changing technological contexts are an opportunity for health services at local level to improve data transmission and strengthen equitable health systems in rural areas and improve quality of care. So far, a total of 57 HEWs and 68 health professionals have been trained on using the e-health platform. Two female HEWs per kebele receive training on using the phone, data input and how to send the data to the server, where it is checked. The technology makes reporting easier for the HEWs who can enter the data for ANC visits, delivery, postnatal care, identification and registration of pregnant women and TB in real time. HEWs can then access a woman’s profile to determine all the services she has previously had. This data is then accessible by the health centre to be used the same day; health centre staff now have access to timely, complete and accurate data via a simple management system. In Bona Zuriya district the system has seen an increase in numbers of skilled deliveries, which is now at 98% and has also helped to reduce drop out rates for ANC visits. Since the introduction of the mobile phones the number of those lost to follow up has reduced 39%, and is now as low as 11%. The Head of the District attributes this reduction to the follow-up SMS service, which is helpful in reminding HEWs to visit expectant mothers in the weeks leading up to their due date. Importantly, all levels of the health system may receive an SMS, helping to improve accountability throughout the health system. However, challenges remain electricity outages and limited Internet connection. To circumvent this data can be input without connectivity and is stored until the phone reaches Internet connection at which point the data is automatically sent to the server. The role of HEWs as agents of change is long established in Ethiopia, with HEWs remit extending beyond health to ‘social change’ agents also educating community members on agriculture, education and improving overall village development. The female HEWs also have opportunity for improved social mobility by having a paid job, contributing to better health outcomes in the community and potentially saving lives. However, recent research found that despite the potential for the HEP to contribute to strategic advances in women’s position, unfavourable terms and conditions mean that improvements in status are minimal. Listening to Mehret’s experience suggests that this technology may be one way to move this agenda forward and improve social currency of the female HEWs in this region. “People admire us having the phone… the government recognises the work we are doing… It’s changed our relationship with the community. Now people see us for our good achievements. In pregnant women forums we bring solutions and achievements and can filter voices up to the health system”. We also heard about women’s groups that have been set up off the back of the pregnant women’s forum (which was facilitated by the e-health platform) where women contribute money into a kitty to host a traditional coffee ceremony to mark the new arrivals once a mother has given birth. This creation of a safe space for women in the community to come together can be seen to be gender transformative as research has shownstrong relationships between women in communities to be a critical factor for women’s economic empowerment. **The e-health platform is being piloted by researchers at Sidama Zone Health Department (REACH Ethiopia) in collaboration with colleagues at the Liverpool School of Tropical Medicine (LSTM) under a grant from the IDRC. **See also REACHOUT programme which supports HEWs to deliver quality maternal health services, and like TB REACH, this is showing promising impact.